The spring-assisted Cobra keyboard mechanism needs no adjustment knobs or levers to change keyboard height; simply lift the keyboard to its desired position and release. It's your choice, sit, stand or work anywhere in between. 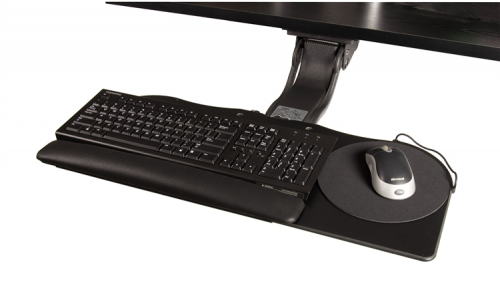 The 26" wide platform is ideal for today's compact keyboards, and compliments smaller work stations. The elimination of a palm rest in the mousing area of the platform offers users a greater ease of movement while at the same time reducing arm reach by allowing the mouse to be position closer to the platforms leading edge. When the mouse is used at a comfortable distance and level, a wrist rest is not needed and can actually cause more problems than it solves. Constructed 96% of steel and is recyclable.